August is Free Food Month! From Last Month: Washing Coming Out of My Ears! How are you going? I have a confession to make. When we started Simple Savings my thumbs were so brown I can't even think of an analogy bad enough to describe them! But, things have changed. Since last year's "From the Yard Challenge" we have eaten 'something' from our yard almost every single day. Often that something was just a sprig of mint, some eggs or a pinch of basil. But some weeks it was 50 kilos of bananas or 20 kilos of mulberries. And, my favourite part is all that food was free. Free from preservatives, free from additives, no food miles and it was grown on land I was already paying for. The food was free, free, free, free, FREE! I would love for everyone to be able to achieve the same goal. So please join us in this month's Free Food Challenge. Please put in the effort and learn how to get produce from your yard. Keep reading this newsletter and you will see why it is so very important. This month's newsletter also contains some incredible stories from members which are guaranteed to warm your heart and make you smile - just like your wonderful emails make me smile! Must be time for a break, my tummy's rumbling!' Hanna announced. 'Great minds think alike! How about I make us both a cup of tea?' smiled Sally. As she was filling the jug Sally saw Hanna reach into her bag and pull out a banana! She got such a start she nearly dropped the kettle! 'Oh my goodness!' Sally thought in amazement. Since when did her frugal friend develop such expensive tastes? 2. August is Free Food Month! This year has been a really tough one for fresh fruit and vegetables. Freak weather has wiped out crops time and time again. This has pushed up prices and made it hard for everyone. It would be fantastic if this was just a one off. But, climate change means 'freak' weather events like we have experienced this year are going to happen more and more regularly. And, with the effects of 'peak oil' following closely behind it, it is going to get harder and harder for us to 'buy' fresh produce. So this means we really have to change the way we do things. We need to start learning how to get our produce for free. The reason this year's weather pushed up the price of bananas is that we grow 90% of the nation's bananas in one small region in Northern Queensland. This area is small enough that one cyclone can take out the whole crop. This is a real shame because even though bananas grow nicely as far south as Newcastle, it is not economical for farmers to grow bananas there. Bizarrely, bananas grow so beautifully in Far North Queensland that with oil at its current price it is actually cheaper to grow them up north and transport them thousands of kilometres than to grow them down south. Most of the time this seems to work for everyone. Things only fall apart when a big cyclone hits or when the effects of peak oil arrive and prices SKYROCKET! In case you have heard people toss around the phrase 'peak oil' but never really known how it relates to you, peak oil is when the earth starts running out of cheap-to-extract oil so the price of oil begins to climb and production starts to decline. It happens slowly at first and then picks up speed. No one is really sure when the full force of peak oil is going to hit, but it will be a lot like a cyclone. At first we will just get a few whisps of wind, oil prices will go up a little bit and then go back down again. We will have several false alerts and many will start to ignore the reports. Some will get cocky and others will be well prepared. Then the storm will hit land. But unlike a cyclone it will not just hit in one small area. It will hit the whole country at once. When the effects of peak oil really kick in, banana farmers will still be able to grow and pick their crops, but they won't be able to pay for the petrol to put in the trucks to ship the bananas to market. So the harvest will be left on the farms to rot. Then, as the high oil prices continue, farmers will stop planting bananas because they are losing money. The only people left eating bananas will be the mega rich who can afford to pay $50 per kilo and the Happy Hanna's who established bananas in their yard years before the crisis happened. It would be lovely if this problem applied only to bananas. But, as everyone has seen this last twelve months, it doesn't. Many of our crops are grown intensely in small vulnerable areas and then transported thousands of kilometres. The cost of producing food this way is going to SKYROCKET! Suddenly, everyone's food will have to be grown locally. There is a major problem with this; we have lost the skills, the trees and the land to grow our food locally. How many people do you know who could grow fruit and vegetables for their family if they had to? How many people do you know who could milk a goat or make their own cheese? What would everyone do if the price of food went up 300% in a month and then stayed there? I wish I knew the answer to that question, but I don't. I wish I could stop cyclones and peak oil from coming, but I can't. (Heck, most mornings I can't even get the kids to school on time.) The things I can do is put plants in the ground now, keep chickens now and make sure my family have the skills to get free food from their yard the way my grandfather used to. And for those of you who would like to learn how you can keep chickens safely and easily in your own backyard, our specially designed 'chicken tractor' has been a huge success with members! Download your instructions for free here. "On the 26th of March 2009 our second child, our first daughter Yasminah, was stillborn. I have been a member of Simple Savings for many years and during my pregnancy and after my loss, my SS family were there for me. It was and still is a devastating moment in my life that has changed my world forever. Not a day goes by that I don't miss her. "There were so many things I didn't get to do with Yasminah and many services I found out about weeks later. I knew from the moment I lost her that I wanted to make a difference and make her life count. She needed to leave her footprints on the world. I started developing my idea of a gift for families who leave the hospital without their child. It would be something similar to a bounty bag. "A few months after we lost our daughter we discovered we were pregnant again and with twins! My idea was put on hold, because I wanted to concentrate everything on this new pregnancy and taking home two babies. At 28 weeks we were told that our twin girls had twin to twin transfusion syndrome where one baby receives more blood flow and nutrients than the other. Every day was a gift and we needed to get them as close to full term as possible. "At 31 weeks and 5 days I started bleeding and went into preterm labour. I arrived at the hospital at 9:30pm and by 11:53pm and 11:55pm our beautiful, but tiny, identical twin girls were born. Aisha and Aaliyah. They spent four weeks in intensive care before finally coming home on my 29th birthday. "After we were settled in at home, I wanted to keep my promise to my daughter Yasminah to make a difference. I have always kept a journal throughout my life. My journals through Yasminah's pregnancy, after we lost her and then when our twins were born eight weeks premature are some of my most treasured items. "I have always been 'creative' and love to scrap so decided that I could decorate plain lined journals for other families to help them through their journey - either when told there was something wrong with their baby during pregnancy (like we were told during Yasminah's pregnancy) in NICU or after they lost their child in pregnancy, birth or infancy. "The first journal was donated on the 26th May 2010, exactly one year and two months after we lost Yasminah. In June 2010, Yasminah's Gift of Hope became an official registered DGR charity. To date we have provided close to 1500 Gifts of Hope to families across Australia and even a few overseas. Sadly we have donated Gifts of Hope to many Simple Savings families too. "Yasminah's Gifts of Hope Journals are a very special keepsake that allows families to keep ultrasound images, photos, cot cards, arm bands and foot and hand prints as a cherished keepsake of a precious life. Each journal contains a special page that the family can fill in about details of their child, like name, date of birth, place of birth and details of the funeral or memorial service if their child has passed away. We encourage families to write about their journey. The family may like to keep it as a diary during their pregnancy after being told their child has a congenital abnormality, a journey through the roller coaster ride of a Neonatal Intensive Care Unit when their child is born premature, or life after the loss of their child. Some other uses are to write about the birth of their child, write poems about how they are feeling, write a letter to their child and keep any cards or messages received from family or friends. "Most importantly, families can write down details and memories about their child to treasure forever. A Gift of Hope. "I dedicate my time to running the charity, as well as managing a household, raising my three beautiful children and being a wife and friend. I am the president and am supported by a wonderful team of volunteers, many of whom are my friends or friends I have made through my journey. We even have a few SS volunteer members. I really enjoy decorating the journals and can say I have probably decorated a few hundred on my own. It is so therapeutic and I feel close to Yasminah when I do them - it helps me heal. The most important thing for me is that families know they are not alone and they can create beautiful memories and with the aid of their journal have hope to heal. "There is so much more involved in running a charity than I ever thought, but I wouldn't change any of it! I decorate journals, have single handedly created most of the content on our website www.ygoh.org.au, visit hospitals, support families and love what I do. They say find a job you love and you will never work a day in your life. Because of SS I have been able to stay at home and be with my children and run the charity." Rebecca wins $100 for sharing her beautiful story. Well deserved, we're sure you will agree! Congratulations also to our five runners-up - Megan McGowan, Philip Baker, Leigh-Ann Hargreaves, Mandy Garters, Louise Spaulding - who each win $50. Congratulations to all our winners. You are truly inspirational! Our Hidden Gems directory is designed to help members find it easier to source the best deals in their area. Whenever you come across a real gem of a store, enter it in our Hidden Gems directory and you could be in to win our monthly prize of $100 cash! This is our way of saying thank you for helping other members save by sharing your knowledge. The more information you can give us, the better your chance of winning. This month's winner is The Lebanese Loaf as nominated by Lorax. Read her entry to see what makes them such a great example of a Hidden Gem. In this little Hidden Gem of a store the Lebanese owners spoke English with me and treated me as if I was part of the family. They treat my kids with indulgence and tolerance just like we ARE part of the family, which is a very rare thing indeed to be made to feel like that in a store. It's not because I'm a 'regular', it's just the way they are with everyone. It is apparently something of an institution and people come from far and wide to go there. So, what do they sell? The BEST Lebanese bread, fresh from the oven, piping hot and sooooo soft. Just delicious. Worth the trip for that alone! You can also get baklava and biscuits to die for (not all swimming in honey and soggy like many places). They also sell nuts and legumes and pulses and all manner of flours and dried fruits. They apparently make a mean coffee (although I can't vouch for that myself because I don't drink coffee)! The staff are fantastic, so friendly and helpful. If I'm getting baklava and say that I am just going to grab some bread they won't hear of ME walking the two metres to get it, they go and get it for me or have someone bring it to me! They encourage me to sample things and tell me the cheaper way to buy things. For example, when buying single pieces of an item (I wanted four at $1.50 each) they advised me to buy ten pieces instead because then they were sold by the kilo and the ten pieces cost just $5.80. They didn't have to tell me that; as shopkeepers they were going to get more money for less produce if they stayed silent but I was 'family' and they shared their knowledge with me. Price-wise they are excellent value, especially considering the quality of product that you receive. In summary: Fantastic foodstuffs, friendlier than friendly staff, great value. It's a gem for sure. Congratulations on being this month's winner Lorax and a huge pat on the back to The Lebanese Loaf for providing consistently outstanding customer service and value for money! You can enter your own Hidden Gems into our monthly competition here. Thank you and good luck! This month's winner is Rob n B for this extract from their blog "Picture of the Day." If these photos don't make you want to get out in the garden and grow your own food, we don't know what will! Some of the other pickings lately have been purple cauli, purple kohlrabi, beetroot, broccoli, snowpeas and buckets of sugarsnap peas. The mangle's greens have been picked a few times and used as a Lettuce replacement in a few meals..
We have been wanting to get more self reliant with our food (hence the ever expanding garden) for a while now and have taken the plunge into Aquaponics with a small trial Aquaponic/Barrelponic system made from as many recycled bits as we could scrounge/buy..
Well, it's not really a trial as we already have 3 X 1000L IBC tanks that will be turned into a Jade Perch Aquaponic system giving us fresh fish... We will be trying to produce as much food for the fish by feeding them home-grown worms, Black Soldier Fly larvae and duckweed grown in troughs (with some Yabbies, Thanks for the idea L208). Hopefully it will turn out to be a very SS venture.. We already have some freebies and bought some VERY cheaply purchased parts for the two systems. The smaller one will eventually be turned into a herb system that we will put on the deck (if/when it gets built) as a bit of a water feature.. Does 'free food' sound like a dream to you, as you look down upon your not so green fingers? Never fear, our helpful members are here! There are so many fantastic threads in our Forum to inspire and inform that even the novice gardener can get something set up and growing in no time at all. Read on for home-grown food made easy! Winter vegie garden - What's in yours? This is thread number 9 in a fantastic series where members have been discussing everything a person needs to become a dab hand in the garden. Mushroom kits - are they good value? Here, member Shamaroo inspires everyone with a cheap, home-made mushroom kit. Onions in or out of the compost bin? Eggshells or not? Meat? Dairy? What CAN we safely throw into our compost bins? Find out here! In this thread you can learn how to make those store bought herbs and vegies work double shift for you. From basil to shallots, tomatoes and pumpkin - don't throw out that less than perfect produce, plant it up for some bonus home-grown free food! 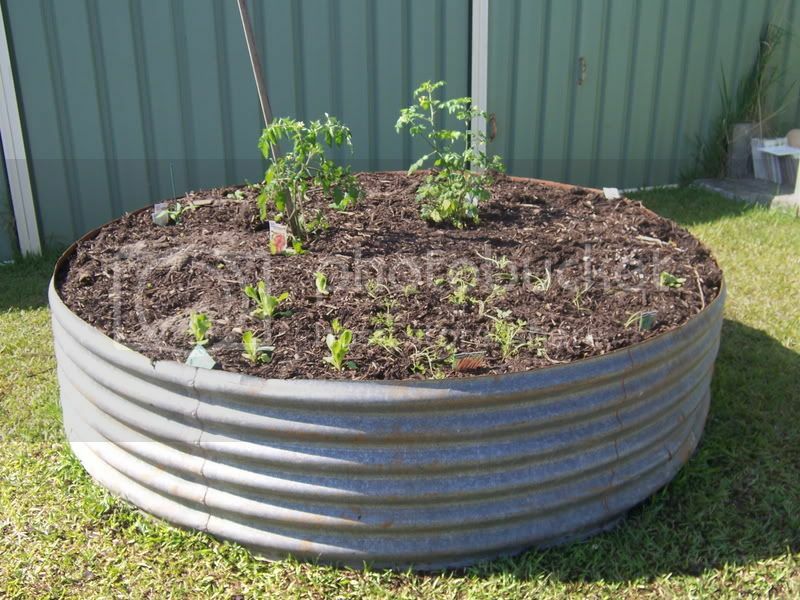 Renting - what vegies are good to grow in pots? With just a little know-how and energy, even those of us with limited space can grow our own delicious and nutritious food. Our members show you the way. The Vault is just jam packed with ideas on how to get your hands on cost effective, home-grown produce. So come on Simple Savers, let's get those gardening gloves on! I'm growing cherry tomatoes, big tomatoes, cos lettuce, iceberg lettuce, baby carrots, cucumber, silverbeet, bok choy, spring onions, basil and coriander in my own back yard and the whole thing only cost me $29 to set up. Here is a photo. An old tin water tank, obtained through Freecycle. I cut it in half, ending up with a big pot, 1.5m diameter x 0.6m high: free. Cutting blades for the grinder to cut the tank up: $5.00. Mulch from the tip: free. Soil, from a landscape supplier. The machine drivers weren't there on the weekend so we shovelled a ton of it ourselves and got a discount. We split the soil with family: $10. Garden hose from yard sale to cover sharp edges (not in photo): $2.00. Plants, I grew some from seed and bought some seedlings: $12. Along with our chooks and making my own yoghurt, I'm on my way to running a self-sufficient, healthy, budget conscious household. If you're daunted by the thought of growing your own vegetables, try these simple steps to get started. Find a spot in the garden that gets plenty of sun. Dig compost into the soil. Make your own compost by using a plastic garbage bin with a lid. Cut a big hole in the base so when the bin is full and has had time to compost down, you can simply lift the bin, wait for the compost to fall out and start again. Save the seeds from pumpkins, tomatoes, watermelon and so on. Prevent moisture from evaporating by using mulch. Keep a bucket in the kitchen and bathroom to recycle water for use in the garden. Fertilise! I made my own worm farm using a cheap plastic garbage bin from The Warehouse and two round plastic bulb savers from Bunnings. For $45 I had a small bag of worms delivered from www.wormsdownunder.com.au. I dilute the worm casting liquid until it looks like weak tea and pour onto the vegies - they love it. Don't plant the same thing in the same spot. Rotate the crops to prevent diseases growing and enjoy eating your cheap, fresh produce! My avocado and mandarin trees have paid for themselves this winter! Both trees were purchased already grafted so I didn't have to wait years for them to bear fruit - my avocado tree cost $40 eight years ago and fruited after four years. This year, I picked over a dozen avocados from the tree which is now four metres high. The mandarin tree cost around $17 two years ago, and this year has provided up to 50 mandarins. Both trees have the yummiest fruit you could imagine, even though we were told they wouldn't grow where we live because of frosty winters. In fact, the fruit is so good, my colleagues steal my lunch just so they could try it! My other trees, including apple, lemon and pear, are doing well and next year I hope to be able to tell a similar success story about my young peach and orange trees. I love fruit trees because they provide every year and I never have to garden - just mow and water! Grow two tonnes of food for $19.50! The Diggers Club has a Low-Income Vegetable Offer which is a collection of their highest yielding varieties of vegetables and is available to Health Care Card holders. The Diggers Club phone number is (03) 5984 7900. Their web address is www.diggers.com.au. I have a vegetable garden only 10 metres long and four metres wide. I spend an average of four hours a week on the garden, which includes the time to blanch and freeze surplus produce. We are a family of four on only one wage as I stay home with our three and five year old children. I now spend only about $7.00 a week on fruit that is in season and on special. I save a minimum of $40 a week which, after our initial outlay, is a saving of $2034 a year of healthy, pesticide-free produce. I didn't know how much produce I could grow with our cold frosty winters, but I managed to grow a lot. I am more limited in summer as we are on dam water. First I put fly screen over the holes at the bottom of the box so I don't lose soil. Next, I add a layer of newspaper and wet it, then a layer of manure, followed by layer of compost, cut lucerne, and repeat each layer (except the newspaper) wetting each layer as you go, until you reach the top. Then you are ready to plant! As the soil drops down, simply re-layer on top. I have found no need to use pesticides and over time have discovered that most things grow successfully this way. I have found that carrots and beetroot really prefer growing in the ground, but have had great crops of tomatoes, basil, capsicum, snow peas, cucumbers, zucchini, pumpkins, radishes, cos lettuce and parsley (seriously, I had such a good crop I had to use hedge trimmers!). Thanks so much to all our members for keeping our Simple Savings site just bursting at the seams with handy hints and tips on just about anything! Here are some extra ideas to inspire you to grow your own food. What a great feeling it is to be able to provide for your family from your own backyard. I love the thrill of just ducking out the back, to snip a bit of this and a few leaves of that, for dinner or lunch. Even better is the look on our guests' faces, young and old alike, when you tell them it's from your own garden. Their eyes grow wide with admiration, and they seem to enjoy the meal all the more. To be truthful, most of my friends and family look at me with blatant disbelief because my green thumb runs more to the black, fungi and bug-ridden in my garden, rather than the lush and edible. Nonetheless, I persevere, and one of the vegetables which have actually rewarded my efforts, however haphazard, is zucchini. I hear you groaning already. Yes, Mum used to serve them up as translucent blobs with butter, or even more hideous, try and hide them in white sauce, but WE KNEW, I tell you. Their zucchini-ness still shone through, no matter how she tried to disguise them. In more recent times, however, I've come to appreciate zucchini. You can eat them raw, baked, stuffed, grated into salads, cut into julienne strips for stir fry or sliced and pickled like cucumbers, and with just a little TLC, the plants reward you with a bumper crop. Our new favourite is 'zacos'. What is a zaco? It's taco filling inside a zucchini! Crisp like a taco, smoky flavoured like a taco, but unbelievably, even better than a taco. Why? Because you can't grow tacos in your own backyard! Try them. I bet you like them! Line your baking dish and heat the oven up to 200C. Grab your zucchini and lop off the ends. Then carefully, with the pointed knife, slice them right down the middle lengthwise so you end up with two long halves. Now the next trick is to give the zacos a hollow in which to spoon your yummy, fragrant Mexican mince. I use an apple corer for this and make my hollows simply by running the apple corer straight down the middle of each zucchini half, creating a little channel. You can do it just as easily with a small teaspoon. Just scrape it down the middle, forming the channel with the rounded end of the spoon. Save all those bits you just dug out, because they can go into the Mexican mince. Just dice them up roughly. Line all your little zucchini dug outs up in your baking tray. Heat your hotplate up to full power, and put your pan on top. Drop in the onion and stir fry until it's sort of see-through-ish but not brown. Then add your mince. Cook that for about 3-5 minutes until it's all golden brown and crumbly. Very carefully remove from the heat and pour off any liquid or fat left behind in the pan. Return the pan and the crumbly mince to the hotplate, and get the mince smoking and steaming again. Now let's add our sweetly fragrant spices; the garlic, smoky paprika, cumin, coriander and chilli (if you're having it). Get the mince all coated in the spices. It should smell pretty darned good now. The neighbours will be thinking there's a Mexican Cantina next door. Add the corn flour and mix well to coat everything then add the water. Now add the bits you've cored from the middle of the zucchini. Stir until the mixture bubbles and thickens. This is the bit where you become a culinary legend. Spoon the scrummy mince into the little tunnels in your zucchini. You shouldn't need more than about two teaspoons of filling to each half. That makes this a wonderfully inexpensive meal. Now finish them off with a sprinkle of grated cheese and pop them into the oven. We like our zacos crisp, so I just give them enough time to warm through, which is usually about 20 minutes. If you want yours soft and gooey, leave them for another 10-15 minutes. The crispness does make them more taco-ish. While your zacos are baking, prepare your serving plates. A bit of salad and a few corn chips maybe gives it a touch of authenticity. When the zacos look all bubbly brown and heated through, remove them from the oven, spoon over a little taco sauce or salsa and some sour cream or guacamole, and serve on your waiting plates. We love ours just topped with sliced fresh avocado. Deliver to El familia and bow to many muchas gracias! Right, so that's a few zucchini socked away. Whaddya do with the rest? Because they'll just keep a-comin'! How about this one? Nice as a light lunch with some home-made bread, or as a yummy side dish with a difference. Have the sesame oil, sesame seeds, stock cubes, garlic and chilli all measured out and ready to go, next to your hotplate. Slice the ends off your zucchini. Very carefully slice them lengthwise into long ribbons. You should get 4-6 narrow strips from each zucchini. Then slice each ribbon in half lengthwise again. This is a task older children from about eight upwards really enjoy. The precision of it fascinates them. You won't hear a peep out of them for ages! Plop them all into the bowl and add the oil. With clean hands, give them a good toss. Now this last bit only takes mere minutes, so make sure the rest of the meal is almost ready to serve and your plates or platter are laid out waiting. Heat your hotplate right up to high and pop on the wok or frypan. You want it literally smoking. Once it's really hot, drop in the zucchini ribbons. They should sizzle like mad! Grab your spatula and spoon and get in there and toss them around, keeping them moving. After about a minute, add all the other ingredients. Keep tossing; making sure the zucchini is well coated with the sesame seeds and other flavours. After about three minutes of tossing they should be starting to soften and go a little translucent. You can serve these crispish or soft and curly according to what your family prefers, so give them a little longer if you'd like them soft and curly. When they're steaming hot and smoky and the smell of garlic and sesame is wafting through the house, they're ready. Use the tongs to pile the ribbons onto your plates or platter and enjoy a new era of zucchini eating at your place! Hard to believe but as of this Friday I will be the mother of two teenagers! Yes, my littlest baby is about to turn 13. Although I'm not quite sure how we're supposed to celebrate it as it seems my children have a party pretty much every week! Well not exactly a party but we certainly have enough people staying every weekend to hold a party! School holidays are here again and by yesterday I think the tally was up to seven kids staying at our place; most of which have been staying for the last five days or more. I don't mind at all though, I think it's brilliant! Although I did stop baking after day two when the last batch of muffins were scoffed in less than two hours! People are always asking us how we manage to feed so many people ALL the time and the answer is quite simply smart shopping, smart cooking and making the most of whatever fruit, vegetables and herbs we have in the garden. If we didn't have our SS skills we just wouldn't be able to do it but through shopping around and snapping up specials when we see them, we manage to keep everyone well fed without making too much of a dent in the food budget. Which is just as well because one of them alone can eat up to 12 Weet-Bix in one sitting. Yesterday while I was working they decided to make breakfast and had toast, cornflakes and Weet-Bix followed by chicken soup, fish cakes and sausages! Noel's chicken soup is a huge hit among the teenage tribe and we've been asked for the recipe so much I thought I would copy it here. Perfect for this time of year with so many colds and sniffles going around! Throw everything together in a large pot or slow cooker and bring to the boil. Cook slowly for as long as you want or until the vegetables and pulses from the soup mix are softened and cooked through. Remove all the chicken bones and enjoy, no need to thicken or blend. Makes a super thick, chunky soup. Yum! One of the boys staying said the other day 'You must feel like the local orphanage!' I guess it does feel a bit like that but it never fails to make me smile when they all drag their mattresses down to the lounge and camp out together, watching the rugby and scoffing pizza. Eventually we run out of mattresses but that doesn't bother them, they just sleep on the couches or in chairs as well! I'm not sure what the neighbours must think sometimes; just the other day a lady walked past and asked Noel if we were selling bikes as there were so many parked outside our gate. Last weekend Noel and I returned from an evening out to find them all leaping around the lounge with guitars. Apparently they had been watching MTV and decided to have a huge and very noisy Karaoke session, followed by a haka competition. For those of you who don't know what a haka is; it's that very loud chant that the All Blacks (and these days it seems the world and his wife as well) always do before a game to intimidate the other team. Fortunately they decided they had better stop that around midnight before they got a visit from noise control. I so would have loved to be a fly on the wall! Still, it's all good, free fun and at least we know where they all are. And the best thing of all is that after years of struggling we seem to have found the cure for Liam's anxiety - lots and lots of friends! He simply doesn't have time to worry about anything any more, he's too busy playing sports and having fun! When we first moved here Noel and I did wonder if we were being a little selfish. We told the boys it would be wonderful and that they would have a fabulous time but really it was our dream, Noel's and mine, and there was a time that we wondered if we had done the right thing by them after all, dragging them away from everything and everyone they knew. I think, however, we can safely say that we have; they are both thriving in so many ways. It's not only the boys who are thriving either. For the first time in longer than we can remember Noel and I have a social life! In fact it's so busy it's hard to keep up! I confess years of farming and being surrounded by other farmers had turned Noel and I into homebodies. It's pretty hard to have a social life when most of your mates have to get up at four o'clock in the morning to go and milk cows! In addition Noel's job means he is on the road all the time so often the last thing he wants to do at the end of the day is go out, particularly when his phone doesn't stop ringing with work calls. But that was before we met a wee dynamo by the name of Kiri and her husband Nigel. Like us, they had been coming to Whangamata for years and decided to take the bull by the horns and move here six months ago. Their enthusiasm and love of socialising is infectious and before we knew it lo and behold we had things to do on a Saturday night! And Monday night, Tuesday night, Wednesday night and Thursday afternoon! Fortunately there are plenty of free things to do, such as a weekly quiz night (which I'm very bad at as I get so excited every time I know the answer I burst it out too loudly and tell all the other teams in the process) and the Karaoke every Saturday is entertaining to say the least! Through them we have met so many lovely people already and what with them and the rugby we really feel like a part of the community. I think you could say that our whole family has found its very happy place in the world! The only problem with having so much fun is that ultimately other things tend to go by the wayside, such as the vegetable garden. At the moment we have red peppers and bok choy coming out of our ears but not an awful lot else. Noel has been talking about building another raised vegetable garden since we moved here nine months ago and not a day goes by when I don't look at my hanging baskets and pots and borders and think 'good heavens, I really must do something about those!' For me at least, running is going to have to come first for the next few months as I can't get behind with my training but I am determined to try and do my bit in the garden before the end of the school holidays. After all, August is 'Free Food Month' and with the amount of people always under our roof, we're really going to need it before too long! 8th - Hooray for R.A.O.K's! Few sounds are as bad as the scream of a child who has jammed their fingers in the door. The sound seems to go right through to your bones. And, it is not a five second scream, it continues until the pain relief kicks in. If you are using Paracetamol like many people do, the screaming goes for about half an hour. But, if you have a homeopathic kit handy and have learned how to use it you can relieve their pain in about 30 seconds and the screaming stops. Well - that is what happened when I jammed my two-year-old's fingers in the bathroom door. Remedies work faster than any other form of medicine I have ever witnessed. So this month we are showing you how to use the remedies to help people when they have damaged their fingers. To read Fran's article, click here. 11. From Last Month: Washing Coming Out of My Ears! "Help! We are a family of four with two teenage boys and I am at the end of my tether with the amount of washing we make each day. I have an 8kg washing machine and we would wash on average two to three FULL loads a day. At this time of year it is hard to get washing dry outside - we live in a very sheltered area with no breeze and the washing can literally hang there for a week and not dry. I have three clothes horses which I use where ever possible and the outside lines are always hung with washing. The tumble dryer has been going constantly for months just trying to keep on top of things and keep everyone clothed. My husband has a work uniform, my kids each have school uniforms and we are a very sporty family so always have a lot of muddy, sweaty sports gear to wash. Hubby and I try to make our own clothing last as long as possible between washes but the kids are something else! Does anyone have any suggestions for some sort of solution, routine or habit that we can all get into to help reduce the load? Thank you in grateful anticipation!" Wow Kim, you are definitely not alone! We received a massive response to your request! Thank you to everyone who sent in your helpful solutions. Unfortunately we are unable to print them all here (they would take up the whole newsletter!) but here is a bumper selection. Hopefully they will help Kim and others to lighten the load! When my boys, now 28, were teenagers I decided that they needed to be made responsible for their own washing, since I did not want their future wives blaming me for not teaching them to be helpful in the home. Doing their own washing made them appreciate the value of keeping clean and making their clothes last longer. They are both married now and help their wives because they know how to operate a washing machine and hang clothes on the line. This helps the stability of their young families, especially given that today's young women expect their men to help around the home. When you know you are doing it 'for their own good', it is easier to enforce and put up with the initial complaints when they are learning to make sure they have that favourite top washed for Saturday night! Make sure that your children are wearing their garments more than once if they're not dirty. The same goes for towels - they can be used more than once and make sure they are re-hung to dry after use and not left wet and smelly on the bathroom floor. Get the kids involved in the whole washing/hanging/sorting process. Nothing will encourage them to be more careful with their clothes than putting the responsibility for their washing back on their shoulders. After all, they are teenagers and it's not too early to learn! Whoever is doing the washing, make sure they're scouting around to ensure they've tracked down all the dirty clothes, then sort them into loads - darks, whites and so on. Don't do a load until you have a full load. Hang smaller garments in the garage to dry on your clothes horses, keeping your outside lines for larger items like sheets or towels that really benefit from drying outdoors. Have a cover over your clothes line (I have rigged a cheap tarp over my line) and then, even if it rains, your washing will still dry, albeit taking a bit longer. It could be my imagination but, since I installed the tarp, the washing is drying quicker, so I think the tarp is also protecting the washing from night dew as well! Relocate your dryer to a warmer area - the warmer the room, the shorter the drying time. Also, make sure you're keeping your dryer lint filter clean as a dirty filter can slow down drying time. Most sports gear is only worn for matches once or twice per week so make sure they're washed as soon as the match is over to ensure they dry in plenty of time. Finally, with regard to sorting, buy only one colour of socks for each child. It's easier to sort socks out if they're all one colour/style. No more missing socks - yay! I find dryers at the laundromat are a good saving. They are large and cheap, if you only use them when you really need to. I find I can get two machine loads in one dryer and it costs only $2.00-$3.00, so four loads of washing dried for $5.00 is worth it. Plus you can fold and put it all away on the same day! When I was first married 36 years ago, I lived in the UK in a small town house. Getting washing dry, especially in the long freezing winters, was very hard. My new neighbour taught me this trick, which I still do even now. When the washer is finished, start the ironing, on the soaking wet clothes. Shirts respond very well to this; put them on hangers and other washing on a clothes horse carefully as not to crease them. They have already started the drying process, they iron much better, as they are not creased yet, and best of all, when they are dry they can be hung up in the wardrobe done! 14-21 loads of washing per week? 61-91 loads per month. 182-273 loads per quarter. 728-1092 loads per year? Are you running a house or a hotel? Your water bill and electricity/gas bill must be horrendous, not to mention the exhaustion from putting through all those loads of washing, drying, collecting, folding, ironing, and putting away in drawers and wardrobes. You don't specify who does all of this, but let's assume it is you. Put another way, if each load is an hour of your time (we know it's more when all is said and done), if you were to divide all those hours by a 7.5 hr work day, you are looking at 97.06-145.6 days per year, or 19.41-29.12 weeks per year. That's over a work month a year in the laundry! What do you think is a reasonable amount of washing per family member per week? Per fortnight: 1 x bed linen and towel, face washer, and so on. This reduces to a much more reasonable 10 loads per week, 20 a fortnight, 30 a quarter, and 520 a year. But how to make this happen? There are two kinds of incentives in life: the positive kind and the punishing kind. I believe that your problem will be halved by familiarising each member of the family with the workings of that mysterious machine in the laundry. He who has to wash, dry, collect, fold, iron, and put away his own clothes, may think twice about sending so many dirty items to the laundry, thus saving water, electricity/gas, wear and tear on the washing and drying machines and exhaustion. Should they go over their allocation, fine them $5.00 for every load in excess or make them do everyone's ironing for a week. A positive incentive involves not just looking at where you can make savings beyond time, money, and the laundry slave's sanity, but how this can benefit your family in other ways: a meal out, a day out, a weekend away, treating a beloved long-distance relative or family friend to a stay at your place, bolstering your emergency fund, or something else that your family would enjoy. Including more time with Mum! I thought I'd share a system I use to make washing more efficient: I have four washing baskets in the laundry for darks, whites, coloureds and delicates. Every member of the family sorts their own washing into the respective baskets. If a basket is full, every member of the family is expected to tip it into the machine, add powder and turn the machine on. If when they open the machine there's a finished load in it then they're expected to hang it out or put it in the dryer. I still need to check the machine every morning for 'forgotten' loads but this system has saved time and money because everyone contributes. Best of all I have reduced the total number of loads because every load is a full one, and this saves on power and water too. I feel your pain! I too have been overloaded with washing but from two reflux babies and two teenagers and my washer is 8kg as well. This is how I dealt with it. I hung removable hooks up in all of the bedrooms, either behind doors or on walls, wherever I could. The kids were going through many changes of clothing but often unnecessarily so I told them to hang clothes they wanted to wear again or that weren't dirty but were worn on the hooks. I gave the teenagers their own washing basket and they were given priority on alternate days to put a load of their own washing on before school. I would hang it or dry it when they were at school and then they were responsible for folding and putting it away after school. I know it seems like hard work to implement and we had a few times where they were complaining about not having the appropriate uniform but they smartened up very quickly when they realised they were going to have to bear the brunt of their own inaction. They also came to appreciate the time it takes and later when I took up the responsibility again, I did not have unworn or barely worn clothes being stuck back in the washing or the dreaded only-put-it-in-the-basket-the-night-before-it-is-needed. Once I took the responsibility back on myself I still made the teenagers responsible for folding and putting away their own clothes. Every bedroom in the house had its own basket and I would just throw them into the appropriate basket. Clothes that needed to be ironed I would drip dry and only iron if I really needed to but teenage boys only wear a shirt one day and it looks creased 10 minutes after they put it on so I didn't bother, except on special occasions. I always put a load in the washing machine just before I went to bed. If your machine has a delay start that works out well and in winter I didn't even bother with the delay start. It means I started the day with a load already washed and so was one step ahead to begin with. Some machines don't have a delay start but they do have a soak option and initially (before my machine broke and I bought the 8kg one) I used to load up the machine, put it on soak and let it fill. I would open up the lid (which would pause it) and then in the morning I would close the lid which would finish the cycle (spin) so by the time I had had my tea I had a finished load and the teenagers could put theirs in or I could do another before I had to take the kids to school. I recommend you have a family meeting including your teenage sons. Discuss the problem, pointing out as they wear the sports clothes they should wash them. Set up a roster and a penalty/reward system. For example, if they don't take their turn at doing the washing they lose their mobile phone/internet; whatever they 'need' the most. Also try to impress on them that if they keep their school shorts/pants clean, take them off when they get home from school and hang them up, they can be worn more than one day. You might have to remind them a few times to change out of their school uniforms but it will be worth it in the end! We live in a very wet, cold part of the country - a temperate rainforest in fact - and I find the only way to dry clothes at this time of the year is on a clothes drying rack that is suspended from the ceiling. We have a double storey section so the clothes rack hangs in the stairwell and as heat rises to the highest point, the clothes dry over night, as opposed to taking three days if they were on ground level. We just used an old baby's play pen, some rope and two pulleys and screwed them into the ceiling joists. I can fit a load of washing on the rack and have it dry by morning! Let your car help dry the washing! I've found that putting washing on a clothes horse in the garage dries in no time. During the day, whenever there is a small rise in temperature, it is amplified by the metal garage door and placing the washing closer to the garage door helps it dry even faster. At night, we park a vehicle in the garage that has usually travelled at least 30 minutes and the heat from the engine is trapped inside the garage and helps dry washing overnight! The way I manage my laundry is not to worry about getting it all done. I do one load a day, and that's enough to keep it moving through, and there'll be days when the pile is huge and days when it starts to decrease. I do the load that is the most urgent and it means there's room on the clothes horse/clothes line to get it dry and the folding pile doesn't get out of control either. Sometimes it feels like I NEED to do more, but the clothes are still there the next day and they get washed eventually, and it has been a huge sanity saver! "Does anyone have a good old fashioned recipe for floor polish?" If you have any tips which can help Denise, please send them in to us here. In just a few months my husband and I have managed to save money, pay off some debts and generally increase our standard of living by making a couple of lifestyle changes. We both work as caregivers for the same organisation, working with intellectually disabled people. Earlier this year he was working some 40 minutes' drive from where we live, in a residential home and I was working for a nursing agency travelling all over Christchurch, sometimes up to 45 minutes' drive away. Just before the devastating February earthquake I made the decision to work for the same organisation as my husband, even though it meant a drop in my pay of $3.00 per hour, but when I applied for my job I negotiated to work close to home, the furthest residential home I work at being 20 minutes' drive away, and the closest at which I am based being five minutes' drive from home. My husband also got a transfer and now works 12 minutes' drive from home. The difference to our fiscal and physical health is amazing. I would estimate that between us we have saved $300-$400 per month on petrol. We could afford to buy ourselves bikes for Christmas and sometimes, weather permitting, I cycle to work, 20 minutes each way, saving petrol and giving me a good workout at the same time. My husband was recently able to buy himself a second hand motorbike which he is currently tuning up, satisfying his enthusiasm for saving money as he estimates that when it is up and running he will be spending around $20 a week to get him to work and back, saving our household budget approximately $60 per week in transport costs, and it satisfies his urge to relive his youth! When I was working all over the place I was physically tired from the extra hours added to my days from driving and I frequently had to ask my boss for advances in my pay just to put petrol in my car to get to work. Now, despite being on a lower hourly rate of pay, a tankful of petrol lasts me for a month or more instead of a week or less, and because I am less tired and close to work I can take on extra shifts as and when required. We both feel good mentally and physically and this satisfies our desire to live a greener lifestyle and cut our carbon footprint. As we are now able to pay off debts and are getting ahead financially, we are excitedly planning an overseas trip next year, which is no longer a pipe dream but becoming a reality! Best of luck with your Free Food challenge. See you next month, if I don't bump into you on the Forum first!